An antiquarian periodical that published antiquarian articles and notes relating to Carmarthenshire alongside articles on local history. The periodical was edited by the journalist and amateur astronomer, Arthur Mee (1860-1926), who went on to edit Who's Who in Wales. Originally a monthly periodical from May 1892 it was published irregularly. 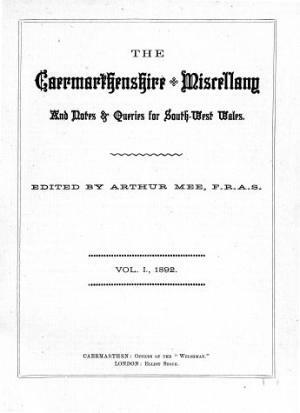 Associated titles: Carmarthenshire Notes (1889); Carmarthenshire notes and miscellany for south west Wales (1890). Publisher Details: Offices of the "Welshman"